One of the masters of motion-capture has opened his own studio in the UK. Andy Serkis, who played Gollum in the Lord of the Rings movies, is opening his own motion-capture academy in the UK, called "The Imaginarium". Serkis, who is regarded as one of the leading lights in motion capture, hope that his studio will be a place to develop the art as well as just record it. 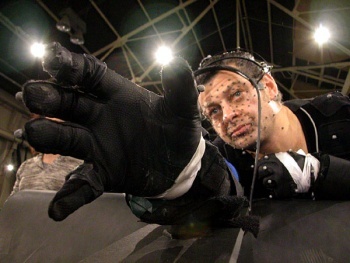 Serkis's motivation for opening the academy came after numerous trips abroad to direct mo-cap work: "I was directing performance capture for two videogames and we had to go one to the US to shoot and the second one to New Zealand," he said. "When I got back I thought, why do we not have this [in the UK?] A lot of the motion sensors were built out of technology that came out of Oxford and Cambridge. We have masses of CG talent in this country. Why are we loosing this kind of talent abroad when we could be doing the exact same thing here?" Serkis is currently working with developer Ninja Theory on its latest game Enslaved, which is due out later this year.